Each year I’ve been at the University Of Lincoln I’ve really looked forward to seeing the games made by the new first years. This year I wasn’t disappointed, there’s some real talent in that group, and I’m really looking forward to seeing them all progress through the year. 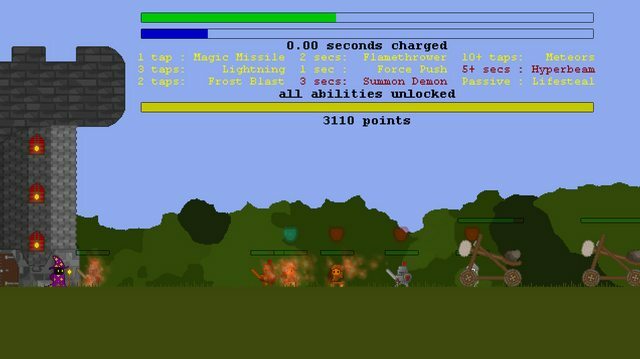 The Legend of Groomp is a simple tower defense game where you must defend against a horder of soldiers using up to nine different spells. Spells are cast by either tapping or holding the Space bar. To unlock spells, you must get experience by killing enemies. Stronger enemies give more experience! My gosh is this game fun. It’s got a really clever take on the one button game genre, using taps and hold-downs of the space button to decide which power to use. The game itself is so juicy – spells feel incredibly good to use, even those at a low level. The spells the player can use also can chain together, for example the flame-thrower can be chained up with a push spell to set other enemies on fire! One of my personal favourite spells is the lightning spell, as it makes enemies spasm wildly and forks across the map in a very cool way. I also love the way that catapults lob rocks at the castle, and then they bounce off under physics… hilariously killing their own men. There is so much to this game, which is especially impressive when you think that they only had two weeks to develop it from start to finish – it has a very high level of polish. I highly recommend trying the game out it’s so good. Also it’s free to download and play… so what exactly are you waiting for?! Download it for Windows! Previous Post Good News Everyone!